Patron/Critic pushed over the edge, chucks rude patron’s cell phone across house. The rude patron (the woman) may be pressing charges. Here are Kevin’s own words about the incident in the National Review. 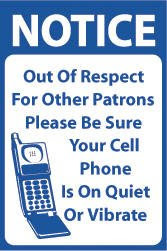 I’ve written about cell phone users and rude patrons before. It is time theatres began shaming and ejecting patrons who willingly disregard notices and reminders to silence and not use their phones during a performance, as well as those who take flash pictures. We don’t allow children to play with toys during a show, so why are we letting adults? UPDATE 5/17/13: To clarify, I don’t mean tar and feathering cell phone abusers. Ejecting an audience member who is willfully ignoring rules to not use their cell phone should serve to shame the offender and offer an example of a consequence to others doing the same. The majority of the audience is there to see the show. We owe it to them to remove distractions. A cell phone in use in the house during a show is a distraction. Remove the offender, and the rest of the audience will thank you. While throwing another person’s cell phone certainly does not rise to the level of “hero,” it cannot be surprising that someone eventually did it. We cannot continue to coddle those who can’t go 30 seconds without staring into their electronic leash at the expense of the majority of our patrons. A cell phone ring or lit screen is FULLY PREVENTABLE. It is not the same as coughing, sneezing, or even a bad whisper. Theatre, and nights out, existed long before cell phones, so it is not necessary to make accommodations for them now. We’re asking them to turn off their phone (which none of them had 20 years ago) for the duration of the performance, not cut out their tongue. This should not be an issue.